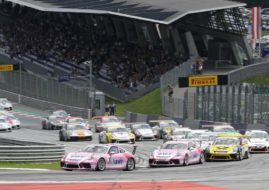 Team Deutsche Post by Project 1 driver Nick Yelloly triumphed in the Porsche Carrera Cup Germany race 1 at Norisring. The championship leader Dennis Olsen started from pole position for the first time in 2017 but lost the lead to Nick Yelloly at Turn 1. Christopher Zochling and Michael Ammermuller were behind the leading pair but on lap 10 they both received 10-seconds penalty because of the jumping start. At the end Yelloly was able to resist Olsen’s attacks and triumphed with a margin of 0.3s. Christian Engelhart was promoted to the 3rd position. The start of the Porsche Carrera Cup Germany race 2 at Norisring is on Sunday, 13:05 CET.